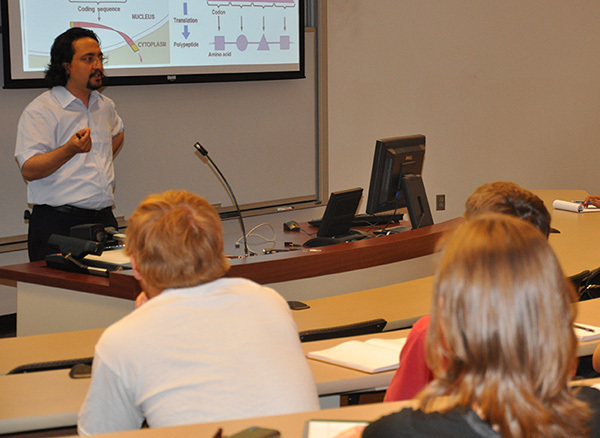 Hasan Otu, an alunnus of the College of Engineering, speaks to students as he joins the faculty of the Department of Electrical Engineering, bringing his focus on bioinformatics to teaching and research at Nebraska. In the DEPARTMENT OF COMPUTER SCIENCE & ENGINEERING, Juan Cui is an assistant professor. She had been a research scientist with the Department of Biochemistry and Molecular Biology at the University of Georgia, following her postdoctoral training there. Her research interests include biomedical informatics and computational system biology, specifically for cancer genomics, proteomics, metabolomics and utilizing computational prediction and modeling in key questions related to cancer diagnosis and mechanism studies. She is active as an editorial board member for bioinformatics journals and in serving on program committees of international bioinformatics conferences, plus has chaired cancer informatics workshops. Born in Xi’an, China, Cui earned her B.E. in information engineering from Northwest Polytechnic University. At National University of Singapore to continue her graduate study in computational science, she was fascinated with the field of computational biology and bioinformatics. She then joined the UGA computational system biology lab, where she led a group in cancer bioinformatics and established her own research program. Assistant Professor Massimiliano Pierobon was born in Bollate (Milan), Italy. He received a Master of Science degree in telecommunication engineering from the Politecnico di Milano, Milan, Italy in 2005 and his Ph.D. in electrical and computer engineering from Georgia Institute of Technology in 2013. He also worked for corporations including Siemens Carrier Networks and with the BWN lab at Georgia Tech, where he earned its Researcher of the Year award in 2011. He is a member of IEEE, ACM, and ACS. His research interests are molecular communication theory for nanonetworks, communication engineering applied to intelligent drug delivery systems and biological circuit network engineering for microbial communication networks. Lecturer Ryan Patrick, a New Jersey native, arrives from the University of Central Florida. He received a master's degree in computer science from Wright State University in Ohio and holds a bachelor's degree in computer science from The College of New Jersey (TCNJ), in Ewing. While at TCNJ, he mentored Ewing High School's Team 2016 of the FIRST Robotics Competition. At UNL he hopes to work with local FIRST teams for an interdisciplinary group of student mentors. In his free time he looks forward to being involved with the University of Nebraska Cricket Club and the University of Nebraska Curling Guild. At THE DURHAM SCHOOL OF ARCHITECTURAL ENGINEERING & CONSTRUCTION, Behzad Esmaeili is an assistant professor of Construction Management. His Ph.D. in Civil Engineering (Construction Engineering and Management) is from the University of Colorado at Boulder. He has a M.Sc. from Amirkabir University of Technology in Iran. His research interests are construction safety, alternative project delivery methods and risk analysis. Chris Cornelius joins the DEPARTMENT OF CHEMICAL & BIOMOLECUAR ENGINEERING as a professor. His Ph.D. and M.Eng. are from Virginia Tech University; he also has a B.S. from Montana State University. In his research, he studies material interrelationships between structure, physical properties, and molecule transport through natural and synthetic polymers, ionomers, hybrid organic-inorganic materials, and sol-gel glasses. The DEPARTMENT OF ELECTRICAL ENGINEERING hired Hasan Otu as a professor. Otu earned his Ph.D. in Electrical Engineering in 2002 from the University of Nebraska-Lincoln; his B.S. (1996) and M.S. (1997) degrees are from Turkey’s Bogazici University, Department of Electrical and Electronics Engineering. He has been a faculty member at Harvard Medical School (2003-present) where he was a research fellow from 2002-2003. He was founding director of Bioinformatics Core at Beth Israel Deaconess Medical Center, Harvard Medical School and was Associate Director of Proteomics Core at Dana Farber Harvard Cancer Center. For the past three years, Otu was the founding chair of the Department of Bioengineering at Istanbul's Bilgi University. His research interests are in the area of bioinformatics focusing on macromolecular sequence analysis, microarrays, biomarker discovery, systems biology, and analyzing high throughput biological data within the context of networks. In the DEPARTMENT OF CIVIL ENGINEERING, Daniel G. Linzell, Ph.D., P.E. is the new chairperson for the program with locations in Lincoln and Omaha. Linzell arrived from Penn State University, where he was Shaw Professor and director of PSU’s Protective Technology Center during his 14 years with Penn State’s Civil and Environmental Engineering (CEE) Department. He earned his Ph.D. and M.S. from the Georgia Institute of Technology, and his B.S. at The Ohio State University—all in Civil Engineering. His research focuses on bridge engineering, force protection and structural hardening; his research interests and experience include laboratory testing, computational simulation and structural health monitoring. Linzell has taught courses including steel structures, bridge design, structural analysis and structural health monitoring. Chittaranjan Ray joins the UNL Department of Civil Engineering faculty as a professor and serves as the Nebraska Water Center director with the Robert B. Daugherty Water for Food Institute. Ray was a Professor of Civil Engineering at the University of Hawaii at Manoa, where he also was interim director of the Water Resources Research Center at UH. In Hawaii, Ray also was Director of the university’s Environmental Center and as chief environmental engineer for the Applied Research Laboratory, affiliated with U.S. Navy. He also held positions in industry and at the Illinois State Water Survey. His Ph.D. in civil engineering is from the University of Illinois. Joshua S. Steelman is an assistant professor. His Ph.D. and M.S. degrees in civil engineering are from the University of Illinois at Urbana-Champaign. From 2002 to 2005, he worked at Hodnett Hurst Engineers, Inc., a structural engineering consulting firm in Huntsville, Ala. His research interests include structural risk and reliability at the component, structure, and regional levels; response of structures to extreme events and innovative methods for structural protection; experimental investigation of structural response; and performance-based evaluation and design of structures. Richard L. Wood comes to UNL as a research assistant professor from the University of California, San Diego, where he has been a postdoctoral research fellow in the Department of Structural Engineering He earned his Ph.D. and M.S. from the University of California, San Diego in Structural Engineering and previously a B.S. at Clarkson University in Civil Engineering. His research focuses on structural dynamics and earthquake engineering; his research interests and experience include numerical simulation and experimentation of buildings and nonstructural components and use of laser scanning within structural assessment. With the DEPARTMENT OF MECHANICAL & MATERIALS ENGINEERING, Karen Stelling is now a professor of practice. Stelling, a 1987 UNL mechanical engineering graduate, was vice president of Aviation & Facilities, FES with Burns & McDonnell, having worked her way up from design engineer in a 25-year career with the international company. Stelling earned her Executive MBA (Entrepreneurship) from the University of Missouri-Kansas City. She is a licensed Professional Engineer in Missouri and is a LEED Accredited Professional and Certified Energy Manager for training and testing. Her focus at Nebraska Engineering is further development of a leadership program for undergraduates.